It may seem like I have a banana obsession and that is partially true. I do love bananas but I did not always. When I was a kid, I hated the texture of ripe bananas; I only ate the green ones. All throughout my teens and twenties, I hardly ate a banana. However, after my temporary ileostomy surgery 2 years ago, I had a hard time eating all the other fruits that I loved with my new digestive set up. I talked to a lot of other Ostomy-buddies and was told that bananas are the perfect fruit to eat, with lots of vitamins and easy to digest, with less roughage. Ever since then I eat a lot of bananas and always have a lot laying around. Banana bread is delightful, but why not try making banana cookies? Yes, Please. 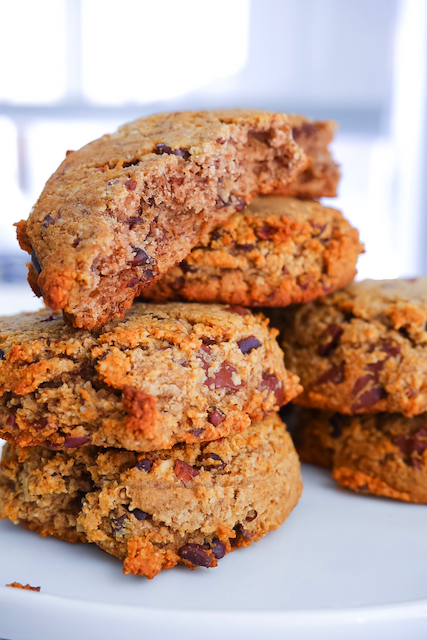 These cookies have almost no sugar (bananas have a lot of natural sweetness), healthy fats from almond butter and a little coconut oil, palate awakening cinnamon and flax meal for added fiber and nutrients. It’s basically a cookie you can eat for breakfast. Bananas are already nice and sweet, but if there is one sweetener that they go well with, it is honey. In this case, raw wildflower honey. I prefer to use raw honey because I think the flavor is better and it not processed. Ordinary honey is usually pasteurized and highly filters. Raw honey is basically straight from the beehive (only strained of impurities). You can certainly use whatever honey you like, but just make sure it is real, organic honey for the best quality. If you are baking for babies or pregnant mums, you can swap the honey for maple syrup or agave nectar. I chose to make these vegan. One of the most popular ways to replace eggs in recipes is flax eggs. I have used them often and they work great, but I have found that if I mix the flax egg beforehand, it gets too gelatinous and, once added, can seize up the batter. Instead, I like to add the dry flax meal to the dry ingredients and the 1/4 cup water to the wet ingredients. I also add an extra 1/4 tsp leavening agent to the mix. Eggs help rise baked goods, so when you take them out, you need to add leavening in the form of baking soda or baking powder. If you would prefer to use eggs, go ahead; use 1 egg in place of the 1/4 cup water and use 1/2 tsp baking soda instead of 3/4 tsp. I have only recently baked with coconut flour. I don’t eat a lot of coconut products, but I was intrigued by the fact that coconut flour not only added structure to baked goods, but also sweetness. It is naturally sweet; so less added sugar needed. For this recipe, I used a mixture of almond, coconut and a wee bit of tapioca flour. Almond and coconut flours are great substitutes for grains in baking. The coconut flour absorbs more moisture than then almond flour and adds flavor. Why the tapioca? It just helps to bind everything together a little bit more so we don’t end up with crumbly-bumbly cookies. It is hard for me to have a cookie without a crunch or mix-in or some kind. My go-to are nuts and chocolate. Well, here I decided to go for cacao nibs and dark chocolate chunks. I used chopped vegan chocolate and organic cacao nibs for the chocolate flavor and and added texture in each bite. If you would prefer to omit the chocolate, go ahead. Try mixing in chopped pistachios, pecans, dried cranberries, or just leave them out all together. And now it is time for banana cookies. Preheat the oven to 350F and line a large baking sheet with parchment paper. In a medium bowl, whisk together the almond flour, coconut flour, tapioca flour, baking soda, flax meal, sea salt, cacao nibs and dark chocolate. In a large bowl, mash the banana with a whisk. Add the almond butter, coconut oil, honey and vanilla and whisk to combine (a few banana chunks are just dandy). Add the 1/4 cup warm water (or egg, if using) and whisk again to combine. Using a spatula, fold the dry ingredients into the wet ingredients, making sure that all the flour is absorbed into the wet mixture. Once mixed, throw in the fridge for 15 minutes. After the chill, use a 2 tbsp cookie scoop or spoon to dollop dough mounds onto the baking sheet, leaving about 1 to 2 inches between each. After all the dough is mounded, use the palm of your hand or a flat spatula to press down the cookies to about 1/4 inch thickness. Bake for 12 to 14 minutes or until golden brown. Let cool for 30 minutes before enjoying with a dollop of vegan cream cheese or a lovely drizzle of almond butter. Makes about 8 large cookies or 12 smaller cookies. Store at in an airtight container at room temperature for 3 days or freeze in an airtight container for 1 month.